The burden we feel always will feel heavy. Whether it be insecurities about our appearances or personalities, we all are broken in some way or another. However, life is an adventure and change will occur one way or another, which is what Miyazaki sought to prove in Howl’s Moving Castle. Howl’s Moving Castle (ハウルの動く城) although assumed to be a simple animation film, like many Ghibli films, deals with many complicated themes such as self-confidence and pacifism in times of war. 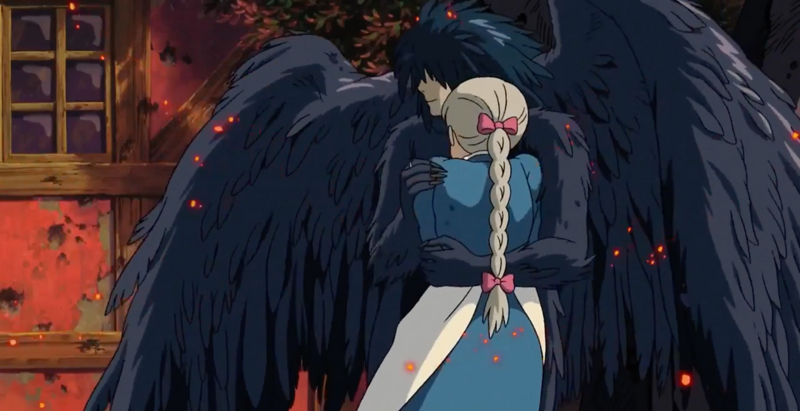 Personally I feel that Howl’s Moving Castle is one of Miyazaki’s finest works, being a Ghilbi fan myself. One thing I love about Ghibli films is how well Miyazaki combines everyday life with fantasy, but yet still managing to tell the audience something deeper than what mediocre animations do. A theme extremely prevalent in the film is the theme of self-confidence or self-esteem. This is mainly told through the characters in the film. 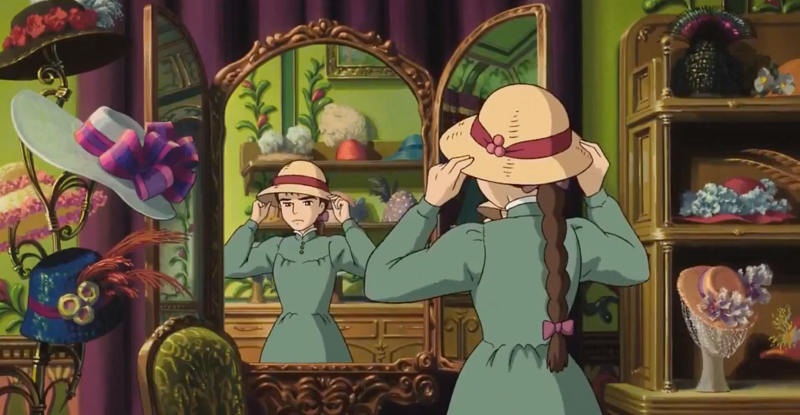 The character of Sophie was first introduced as a young, plain girl who not only has no confidence in her physical appearance, but in herself as a whole. This is exemplified when she is compared to her sister whom was shown to be popular and beautiful. In contrast, when they are placed side by side, Sophie always appears to be on the ‘losing end’- ignored, shy and plain, also mirroring her own mentality of herself. However, when she changes into an old woman- you can visually see the almost immediate change in behaviour through the dialogue and actions. As the audience, we do not see the same shy Sophie but rather, a new character entirely, both in appearance and personality, we see a more mature and confident Sophie. We see someone who’s not afraid of what people perceives her to be. Another character that illustrates this central theme is Howl. Throughout the film, we hear many things about him- he’s dangerous, he will ‘eat your heart up’, he’s a player. Unexpectedly, when we do see him, we see someone who is very broken inside, even going the extent to say “What’s the point of living if you’re not beautiful”. Another thing to note is that his true form is not a human, but rather. He a giant, hideous bird. This once again, in a slightly different way as Sophie, brings up the theme of self-confidence. His hair color changes many times during the film, making it a motif in line with his character change from unaccepting of himself to accepting himself. Howl has many breakdowns. When he did break down, everything around him goes absurd. Things melt, breaks, gets messed up. As compared to when we first saw him, his character had changed completely. From composed and confident to someone who looks absolutely insane and extremely insecure. A filmmaking techniques that stood out for me was the mis-en-scene of the film. The wonderfully crafted locations in the film are not only beautiful to watch, but also fit the personalities of characters, reflecting who they are. 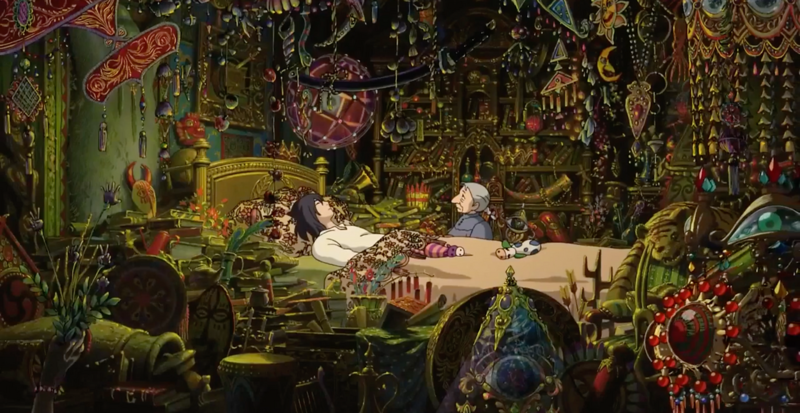 An example would be Howl’s house, specifically his room, is filled with magical trinkets and random objects. At first glance, you would simply assume that he’s messy or that he’s a hoarder. But in actual fact, all these trinkets exist to protect him from the more powerful witches who are on the prowl to seek revenge on him. Howl is afraid, insecure, scared to leave his security. It is this level of detail in something as simple as set design that sets Miyazaki apart from other animators in Japan. Howl’s Moving Castle is one of my favorite Ghibli films of all time. I absolutely love the way the story is presented to the audience, and of course, the art-style. Miyazaki is known to be very meticulous about crafting his film worlds, and Howl’s Moving Castle is no exception. The film also makes very thought-provoking points about the world and human nature, as do most of Miyazaki’s works. Being a “kids” film, it is also family friendly, with a certain degree of humor and also easy to appreciate at face value, essentially making it open to any demographic. With an amazing plotline and beautiful art style, who wouldn’t want to be lost in another one of Ghibli’s worlds?